In 1886 the neighborhood around Third Avenue and 17th Street was largely German, earning it the name Kleindeutchland. But at least one business in the area was Italian-owned. L Faccini ran his four-story boarding house at No. 141 East 17th Street. Faccini obviously housed both Italian and German boarders. Mrs. Louise Schneider lived here in 1886 when her coin collection went missing. The culprit was caught, convicted, and on July 13 was sentenced. The New York Times described the felon as “Frederick Thompson, a colored lad.” During the proceedings, a letter pleading for clemency from the boy’s mother, Mrs. Holland Thompson, of Montgomery, Alabama was read. The woman was unable to write, so her husband a former Assemblyman of Alabama, a clergyman, and a merchant, had done the job for her. “Mrs. Thompson said that she had been a slave and that she tried to bring up her boy in the right way. The boy, however, was wayward,” said The Times. Judge Gildersleeve was unmoved by the emotional plea. He sent Thompson to Sing Sing Prison for two and a half years. The boarding house became the scene of some publicity later that year. When 32 Italian girls, working as chorus girls and ballet dancers, were discharged from the National Opera Company touring in Chicago that December, they were in trouble. They had little money, spoke no English, and were stranded in a Western town a world away from home. The girls were put on an “emigrant car” to Grand Central Depot, and their arrival drew caused notice. A reporter arrived at the Faccini boarding house, where Signora Faccini, “the pretty daughter of the innkeeper, acted as interpreter.” The two girls explained that following the previous Saturday night performance they were handed a note saying they were fired. Each was given $10, or half a week’s pay. How, or if, the bewildered girls got back to Milan is unclear. Boarders in Faccini’s boarding house would have to endure the German music and revelry coming from next door at No. 143. In 1885 Carl Goerwitz opened his Scheffel Hall around the corner at No. 190 Third Avenue, and leased the stable at No. 143 East 17th Street (consistently numbered 141 by mistaken historians) and converted it to an annex of the German beer hall. By 1889 the boarding house was known as Corbini’s Hotel. It was owned by Louise Brunner who hired architect J. Hoffman that year to create a two story extension at a cost of $4,000. Jutting out to the property line, the handsome brick and metal façade featured thin engaged columns with bulbous bases at the second floor that upheld a series of blind arches, sea crest swirls, and a pierced, ornamental parapet. The addition housed a two-story restaurant. The storefront was protected by a slightly-projecting roof with a small hood over the entrance to the hotel at the eastern side. Mattie Kortwright ran the restaurant. She was embroiled in what The New York Times called “a case that grows complicated” in July 1889. According to her, she had invested $710 in the business of diamond broker Edward Giro after he had promised to marry her. “He did not keep his pledge to wed, and she did not see any return for her money,” explained The Times on July 14. When the case came to trial on July 13, Mattie Kortwright failed to appear. Giro told the judge he had received only $95 from her, and that was his fee for managing her restaurant. He then counter-sued, saying that a few days earlier he had gone to the restaurant and was assaulted there by Charles Riss, “a Spaniard,” who struck him with a cane. He pointed out his assailant in the courtroom. “Riss explained that he had warned Mrs. Kortright to have nothing to do with Giro, and this was the cause of the affray,” reported The Times. Riss was arrested in the courtroom and the case was adjourned until the following day when Mattie Kortright could testify. When Mattie appeared the next morning, she said she preferred to drop the charges. The judge refused. The complexity of the case grew deeper when it came to trial again. This time only Edward Giro showed up. “The Spaniard’s” trouble got worse when Justice Smith issued a warrant for his arrest for contempt. The following year the first signs of problems with the “restaurant” in the Corbini Hotel appeared. On January 20 the liquor license was revoked for raucousness, and then again on June 26. No. 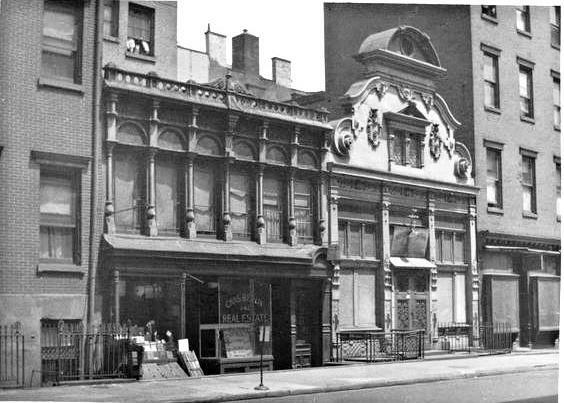 141 East 17th Street changed names again by the turn of the century, becoming Koller’s Hotel. Rather astoundingly, the scandalous property was owned by the socially and politically prominent Hamilton Fish in 1900. The hotel was an important part of the 1904 corruption case against Police Captain Gannon, who was charged with ignoring illegal activities here in exchange for bribes. Witness Henry Wolfsohn was asked to describe what he saw going on there during the summer of 1901. On September 10, 1901 the hotel was raided as an “alleged disorderly house,” the polite term for a house of prostitution. “The warrants were for Samuel Koller, the alleged proprietor, and for ‘Jane Doe,' the housekeeper,” reported The Times. The pair was quietly arrested and locked up. “There was no excitement,” said the newspaper. It was not only Captain Gannon who was on the take. Edward H. Alcott ran the saloon in Koller’s Hotel and in February 1901 he filed charges against Etienne Bayer an agent of the New York Anti-Vice Society and his son, Julius, for extortion. He alleged that in December 1900 the men threatened to have his liquor license revoked “for keeping a disorderly house,” unless he paid them $100. When he refused to pay, he was served with an order on Christmas Eve to show cause before Supreme Court Justice Degro, why his license should not be revoked. On February 25, 1901 the two men were held at $1,500 bail each on charges of extortion. In 1903 both Captain Gannon and Edward Koller were gone from the neighborhood. The precinct was now under the control of Captain Gallagher and the hotel, now called the Rainbow Hotel, was run by Albert E. Smith. Smith had no intentions of changing the money-making illicit operation, however. When 16 prostitutes were picked up for “loitering” on Saturday night, August 15, 1903, Smith hurried to the station house to bail out two of them. The Sun noted that he was just one of several saloon keepers who rushed to provide bail to the women. Captain Gallagher was red-faced on December 13 that year when the hotel was once again raided as a disorderly house. Albert Smith was arrested and his waiter and eight women were also locked up. Captain Gallagher, said the New-York Tribune, “was reported as having been found in the hotel by the raiders.” Gallagher insisted he was innocent, saying he arrived after the raid had commenced. Eventually police and social reform abolished brought respectability to No. 141. By 1913 it was home to the Berlin Renting Agency. Founded by Charles Berlin in 1892, the real estate office advertised apartments and office space from the building for years. In 1922 two young journalists, Henry Robinson Luce and Briton Hadden, rented an office in the building for $55 a month. The men, now both 23 years old, had met at the Hotchkiss School in Connecticut in their teens. There the two boys had worked together on the school newspaper. In 1921 they were both working at The Baltimore News; but they boldly quit their jobs, moved to New York, and in the tiny office at No. 141 East 17th Street formed Time, Inc. Here they composed the prospectus for TIME magazine. The first issue was published on March 1923. Their endeavor would grow into a vast journalistic empire, would change the face of the American magazine industry, and result in Luce’s being called “the most influential private citizen in the America of his day” by his biographer Robert Edwin Hertzstein. In 1944 Hamilton Fish sold the building. While it continued to house a mix of offices, residential space, and retail stores over the decades, it retained its wonderful beleaguered 1889 façade at the second story. In 1966 No. 141 was purchased by artist Alfred Blaustein who commissioned Bernard Rothzied to transform the interiors. The esteemed architect was well-known for his skill in the adaptive repurposing of existing buildings. A cast iron pilaster at the right, and a lonely engaged column to the left are the last fragments remaining of Hoffman's storefront. Rothzied removed the roof of the triplex and installed a large slanted skylight. But despite the modern 1960s interiors; No. 141 East 17th Street retained its somewhat grungy and charming exterior appearance. Today a bicycle shop has been in the retail space—once home to a more-than-shady saloon--for years. And upstairs, in what was once a sordid “hotel,” residents of the high-end apartments no doubt have little idea of their building’s colorful history. I lived in Hotel 17 in the early to mid 1980s, I used to go there when it was Willie's Grocery. Thanks so much for this fabulous write up. I googled the address, as I was curious about the strange little storefront when I passed it today. Your page gave me more than I expected; what a thrilling history!